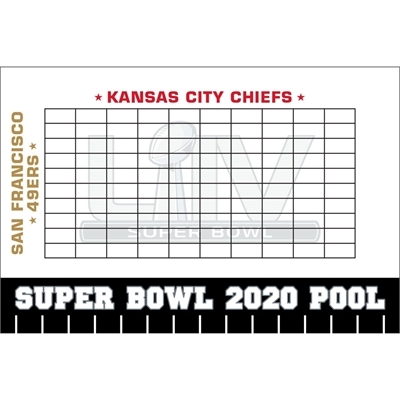 The 2019 Super Bowl LIII Theme Pool Board is here! Looking for an activity for your Super Bowl bash? This Super Bowl pool board is a perfect addition to any party. The board is approximately 2 feet by x 3 feet so there is plenty of room for initials in those betting squares! Choose from a stiff board made on high quality foam core or a heavy duty vinyl banner with grommets in the corners. Sell each square on the grid for a set amount of money. Play big or small, for candy or fun prizes, it's all up to you! The numbers beside each team name represent the last digit in the score for that team. For example, if the score were "AFC team 14- NFC team 3", then whoever's name is in the square under the "4" of the AFC team (Broncos) and the "3" of NFC (Panthers) would win. The betting board is a great way to keep people interested in the game! 2019 Super Bowl 53 Theme Custom Lollipop A fun favor for the big game 2019 Super Bowl 53 Invitation Perfect for Super Bowl LIII! 2019 Super Bowl 53 Theme Logo Ticket Invitation A Super Bowl 53 Theme Logo Ticket Invitation Football Party Tray Perfect for all your favorite football finger foods.